I trust everyone has recovered from the life changing trauma of jiggling the clocks around and will take the next several months to gird their loins for it happening again in the Fall. The horror, it never ends. grrrr! 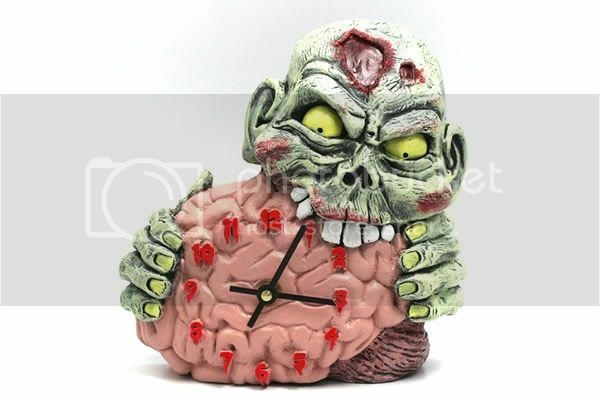 me zombeeee .... want braaaaaaaaaaaaaaaaaaaaaaaaaaaainzzzz! I called the Legislature to lobby. I was told to forget it. then call and try to PROMOTE the Bill. Edgar, edgar, edgar....We (almost) agree at last. 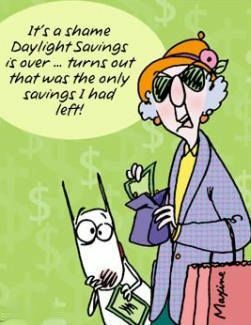 For the first 30 days or so of DST, I hate it. Eventually, though, my sleep cycle aligns and then I love it. I know I'm strange in this, but I prefer it when it gets dark early. When I was a child, having the sun stay up so late would make me feel sad and anxious. I guess in a previous life, I was some nocturnal animal, maybe a wombat or a lemur. I'm glad you recognize that you are strange. Which is not to say that you are defective in any way, but your are strange. My son likes cold, overcast days. That too is strange. Hopefully it doesn't also mean he likes to murder entire familes, but I'm not about to leap to a judgment. I'm going to have to slap you. Nothing will be right again til it is light in the morning and dark at a sensible time. I hate time change. It is wicked and nasty and of no use to anyone sensible. What I don't understand about the plot to give us more daylight is that they do it when daylight is already at it's longest. Why not wait till autumn when the days are short. Now, we suddenly go from sunset around 5 pm at my latitude to a 4pm sunset, and if it happens on those cold, dreary, rainy days of fall, it can be really be depressing.